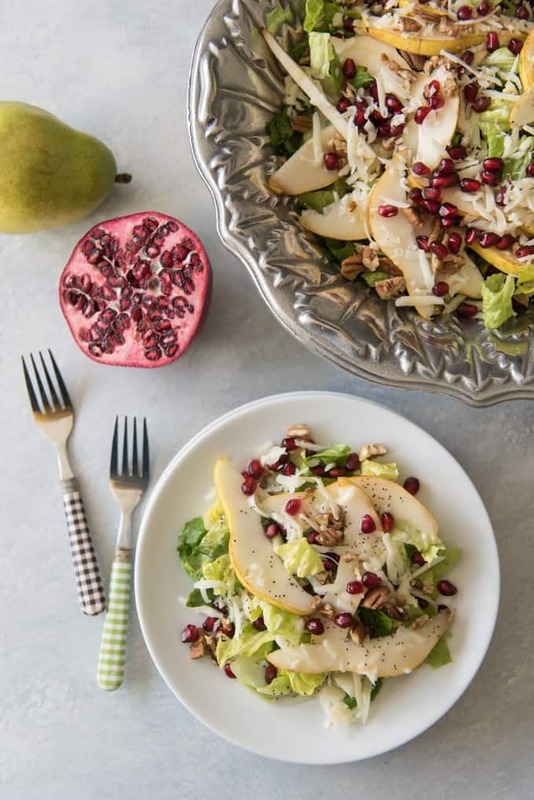 Winter Pear, Pomegranate & Swiss Salad is a gorgeous way to use some of the best fruits of the season and perfect for any holiday dinner. 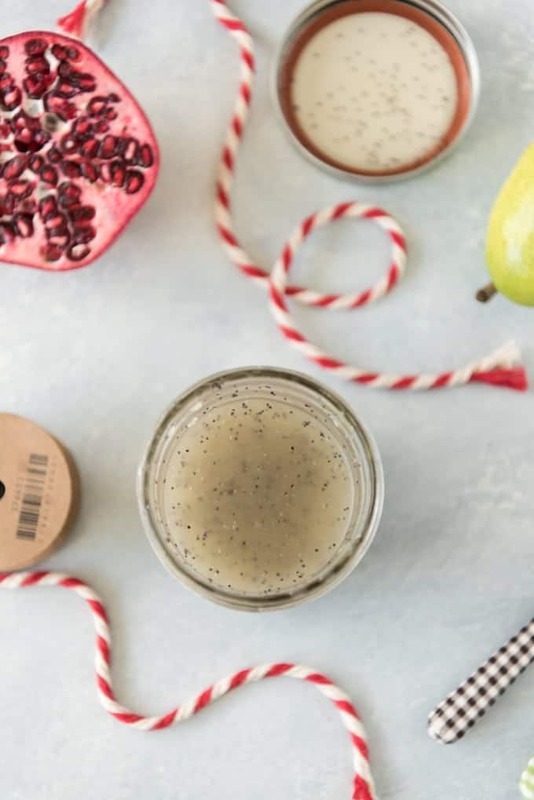 The homemade Poppy Seed Dressing that goes with it is a family recipe that has been passed down and it makes a wonderful DIY Christmas gift for friends & neighbors. This poppy seed dressing recipe has been passed down from Paul’s Grandma Nash and it’s one of my most favorite dressings ever. 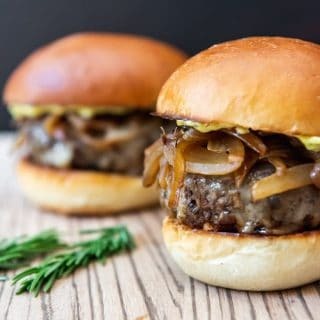 It’s the perfect balance of acidic and sweet with the sugar and vinegar and oil, seasoned with a little dry mustard and grated onion and then studded with hundreds of delightful poppy seeds. 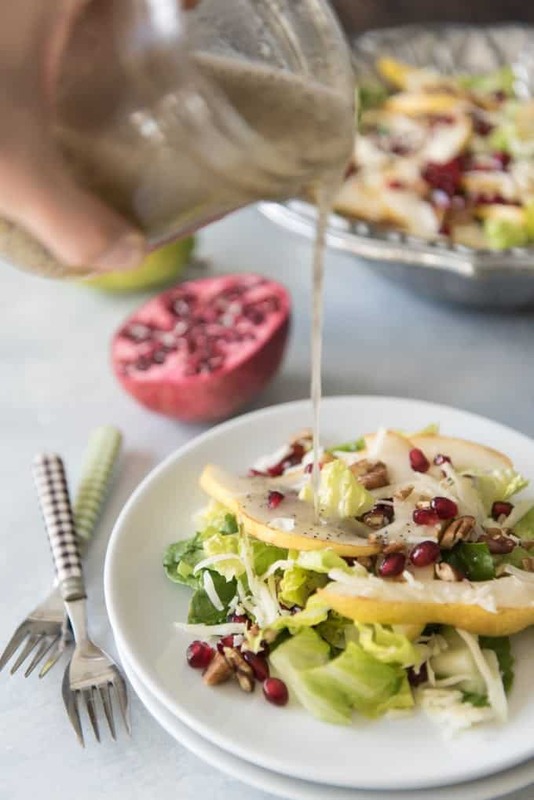 I think it’s the prettiest of all salad dressings and it goes great with so many different salad combinations, although I especially like it with the pear, pomegrante and swiss cheese version that I’m sharing with you today. 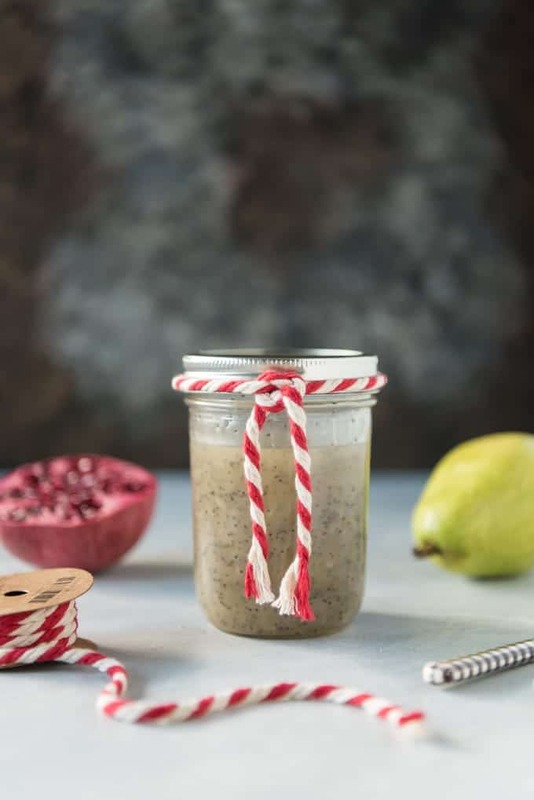 And since one batch makes quite a lot of dressing (enough for 3 half-pint 8-ounce jars), it’s sort of a perfect idea for a different take on an something DIY and edible that you can gift to friends and neighbors for Christmas. 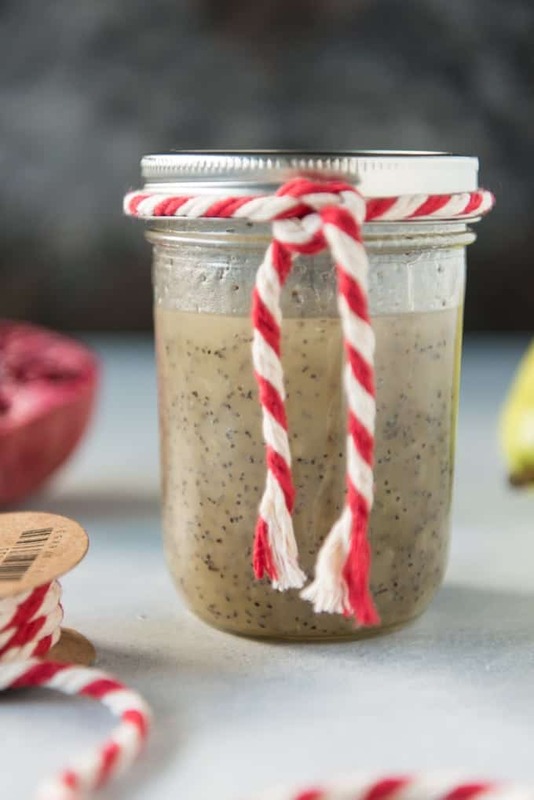 It’s a cinch to double or even triple the recipe and knock out a dozen neighbor gifts in 10 minutes for a fraction of what you would pay for an inferior poppy seed dressing at the grocery store. And look how cute it is poured into small glass jars and tied with a string or ribbon. You could gift it by itself or put it in a small basket with a pear and a pomegranate as a seasonal holiday present that is a little different from the standard plate-of-cookies. If you are looking for other edible DIY Christmas gifts that aren’t quite as run-of-the-mill, some of my other favorite options are Homemade Salted Caramel Sauce or Gourmet Homemade Caramel Apples. Both pears and pomegranates are winter fruits and putting them together in a salad with grated Swiss cheese makes a lovely Christmas combination of green and red and white that is a perfect addition to any holiday table or just for a weeknight dinner during a season when it seems like there isn’t as much variety of fresh fruits to choose from. 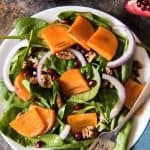 And I love the sweetness and extra bit of crunch from the chopped pecans in this salad. I don’t know why Swiss cheese isn’t used in salads more often. 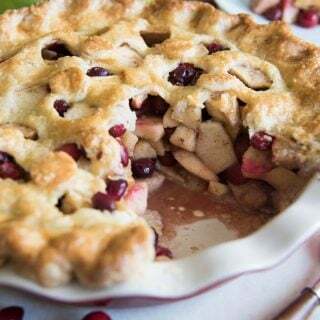 It has such wonderful, savory flavor without being a sharp cheese and it’s savoriness pairs perfectly with the sweetness of the ripe pears and tart pomegranate arils. 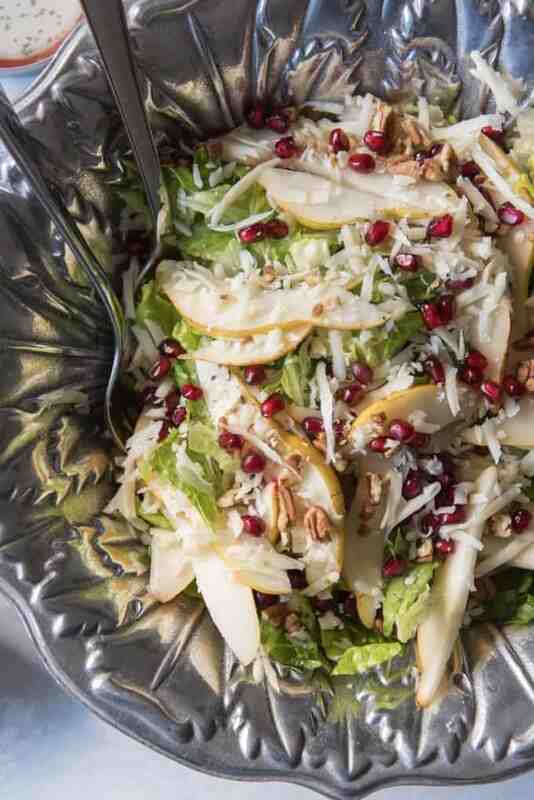 You could switch out the Swiss for feta cheese in this salad and it would also be good, but I really feel like the milder flavor of the Swiss is better suited to the pear while feta goes better in salads with apples. Which probably sounds like hoity-toity food snobbery, I know, but seriously, give them a try and I think you will see what I mean. 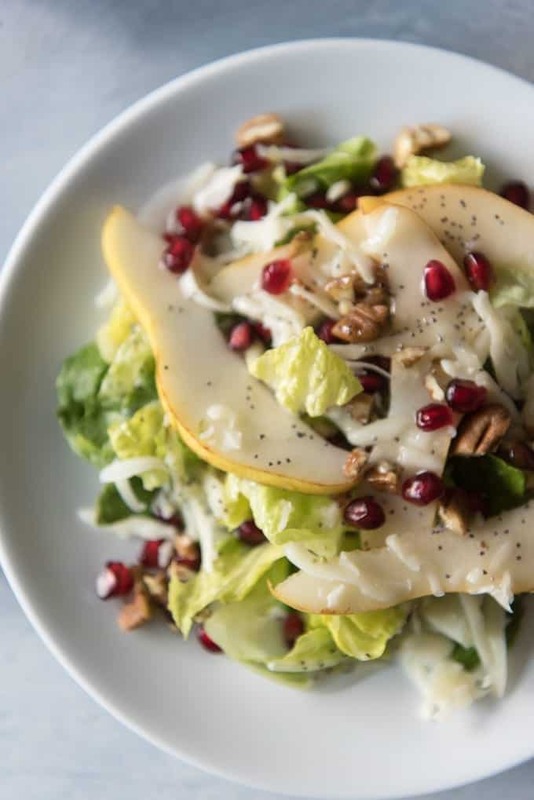 Some foods were just meant to be paired together more than others but that doesn’t mean you can’t combine feta and pears or apples and Swiss. Just remember that one batch of the dressing as written below makes quite a bit of poppy seed dressing. 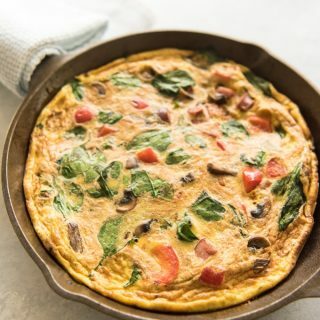 Quite a bit more than you need for one salad. But it stores well in the fridge for 2-3 weeks as long as you shake it well before serving it. Or you could easily halve the recipe. In a medium-size pot, combine the sugar, dry mustard, salt, and apple cider vinegar over medium heat. Cook for 4-5 minutes, stirring occasionally, just until the sugar completely dissolves, then remove from heat. Slowly pour the two cups of oil into the cider mixture, whisking constantly while adding. Add the grated onion and poppy seed to the warm dressing and whisk well. Pour into a large jar or divde among multiple small jars and refrigerate until chilled. Shake well before serving. 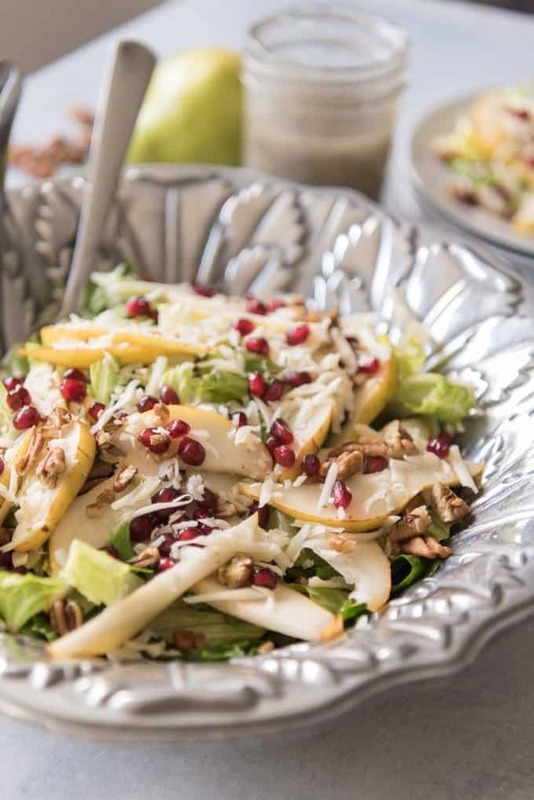 For the salad, slice the pear into thin slices and remove the pomegranate seeds from the skin of the pomegranate. Coarsely chop the lettuce and pecans, then grate the Swiss cheese. Combine all salad ingredients in a bowl, then toss or plate each salad individually. Serve with poppy seed dressing. The colors in this salad are so pretty! It sounds wonderful and my family would love it. I never thought of salad dressings as a gift! Not sure why because I give snack mixes and spice rubs as gifts. Genius! I know my mother in law would like some for sure. She makes her own dressings all the time and really taught me how to start doing it too. Now I can’t eat store bought!!! This salad looks like something we would make too. Love the pears and pomegranates. She gets the Harry and David pears every year for Christmas so I know she will be a big fan. Oh I love the idea of spice rubs as gifts! 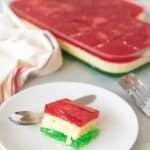 There are just so many sweets and goodies this time of year that it is nice to mix things up with some other options, isn’t it? I’m the same way with store bought dressing – they so often taste flat or chemically anymore! What a gorgeous looking salad and what great flavors you created! 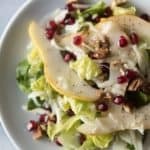 I love to add fruit and nuts to our salads, and now I want to try your dressing! Made this salad as part of dinner for guests and received rave reviews. First time using Swiss cheese in a salad and loved it as well as the dressing! Thanks for sharing! I’m so glad everybody loved it! 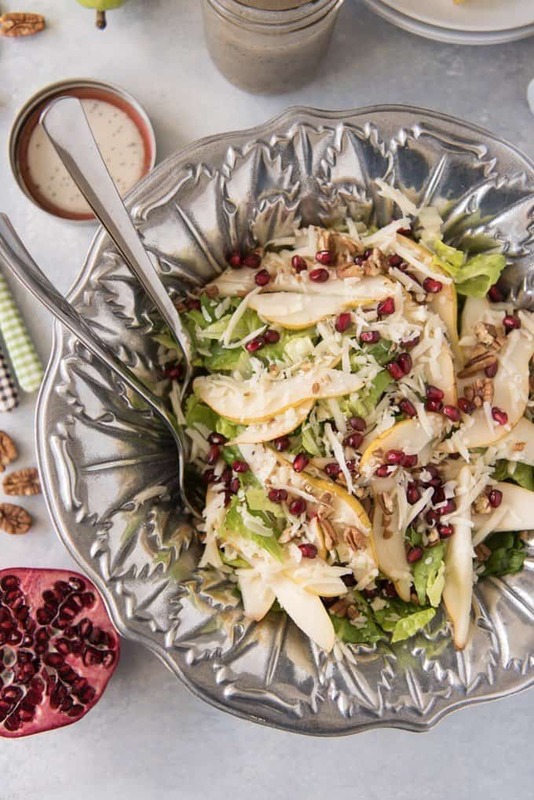 Swiss isn’t a cheese most people think of for salads but it’s amazing in them! Glad you tried it! What a pretty salad! 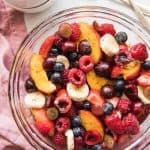 We have been enjoying fruity salads lately and I can’t wait to add this one to the mix!